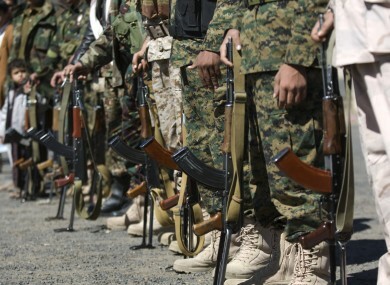 Yemeni authorities have for months pressed a campaign against jihadists. A SUICIDE BOMBER has killed 35 soldiers and wounded around 50 at a military camp in Yemen’s southern city of Aden, military and medical sources said. The bomber detonated his explosives belt as hundreds of troops gathered to receive their monthly pay at the barracks in Al-Sawlaban near the city’s international airport, a military source said. “A martyr from the Islamic State denotated his explosives belt in Al-Sawlaban military camp in Aden during a gathering of the Yemeni army,” the IS-affiliated Amaq news outlet said. IS and its jihadist rival Al-Qaeda have taken advantage of a conflict between the government and the Huthi rebels, who control the capital Sanaa, to bolster their presence across much of the south. The two groups have carried out a spate of attacks in Aden, Yemen’s second city and headquarters of the internationally recognised government whose forces retook the port from the Huthis last year. Al-Qaeda has long been the dominant jihadist force in Yemen, located next to oil-flush Saudi Arabia and key shipping lanes, but experts say IS is seeking to supplant its extremist rival. In August an IS militant rammed his explosives-laden car into an army recruiting centre in Aden, killing 71 people in the deadliest jihadist attack on the city in over a year. A Saudi-led coalition has since March 2015 supported loyalist forces fighting the Huthis. Email “ISIS suicide bomber kills 35 Yemeni troops”. Feedback on “ISIS suicide bomber kills 35 Yemeni troops”.